This Cooperative Research Centre for Water Sensitive Cities (CRCWSC) project examined strategies and tactics for influencing opinion and policy making, to facilitate progress towards water sensitive cities. Knowing what to do with scientific research outcomes can be tricky. 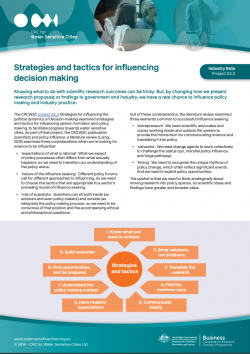 But by changing how we present research findings to government and industry, we have a real chance to influence policy making and industry practice. Timing - we need to recognise the unique rhythms of policy change, which often reflect significant events. And we need to exploit policy opportunities.